Continuing my trip through the vaults of Acta Records, a division of Dot Records set up to release records by new and up-coming psychedelic rock bands. Acta didn't last very long, perhaps three years at the most. They released records from early 1967 to mid 1969. I don't know much about The Domestic Help. I do know that they released two singles on Acta in 1967, this one under my spotlight was their first from June 1967. I've seen a press release (45cat) showing that they were a four piece, smartly dressed in mod threads with moptop haircuts. "A Woman Owns The Biggest Part Of Man" is a folk-rock tune, written by Paul Nicodemus. The latter was a staff writer with Acuff Rose & Four Station Music based in Los Angeles. The song would have been perfect for 1965 but it's way outta time in mid '67. The flip "The Bad Seed" is another folk-rock sounding composition. As you know by now I dig folk rock janglers and this record is a jigsaw piece in anyone's collection. 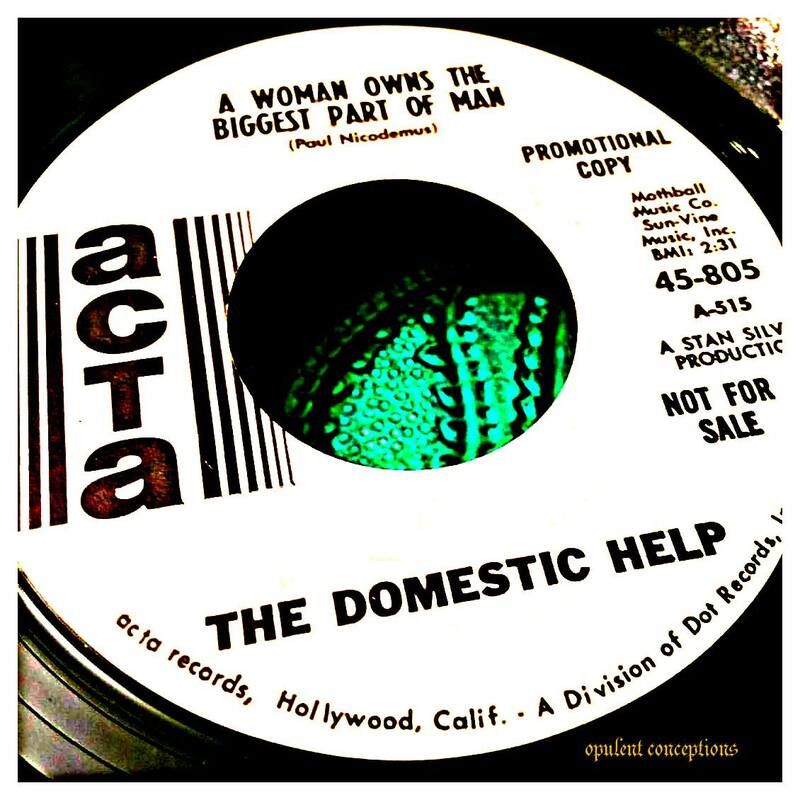 The Domestic Help released a second and last single at the end of 1967, "You're The Potter (I'm The Clay)" b/w "Try To Forgive Them" (Acta 45-814). I've not heard this one. All sides remain uncompiled and virtually unknown.